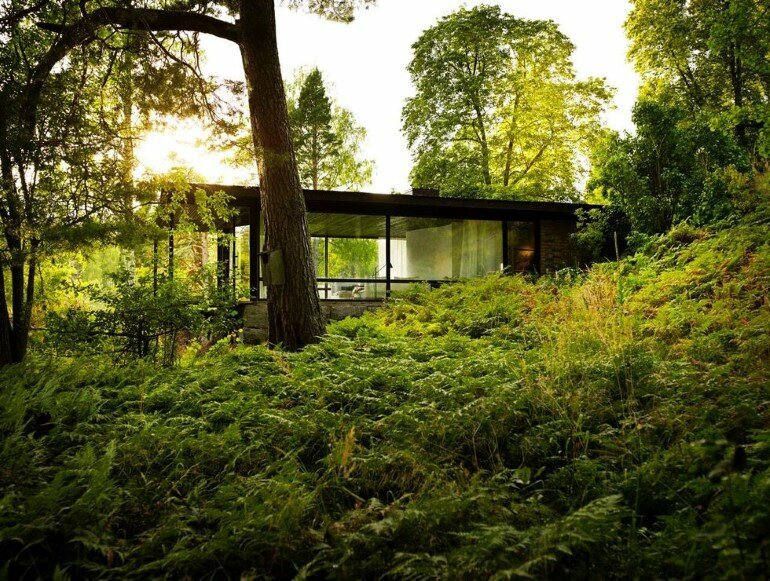 Lundnäs House is a summer house designed by Swedish architect Buster Delin for himself. 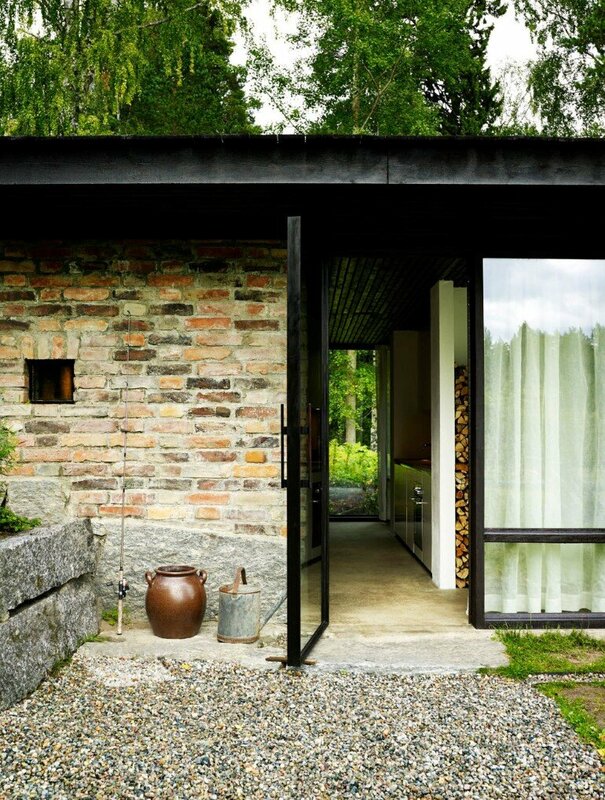 Description by Buster Delin: The Lundnäs House is the architect’s summer house. 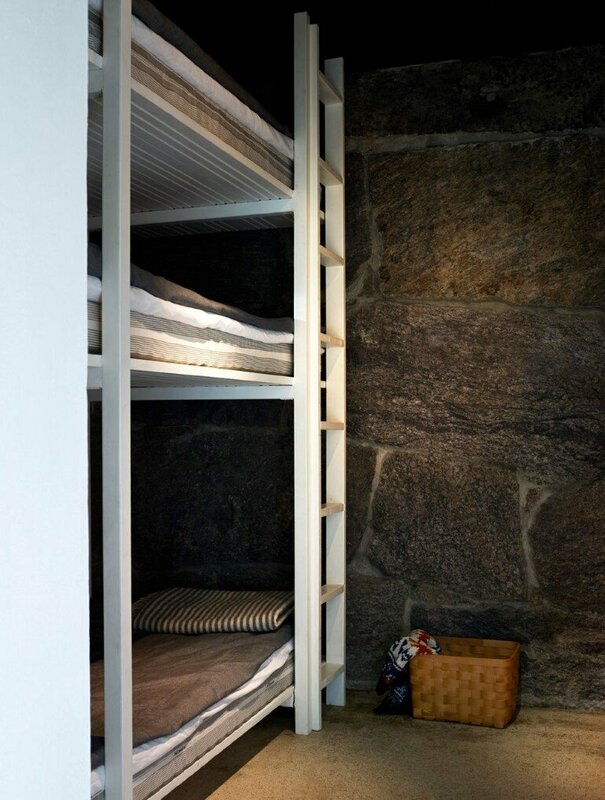 It is located in Hälsingland, Sweden, and is built in the granite foundation from a turn of the century ceramic stove factory. 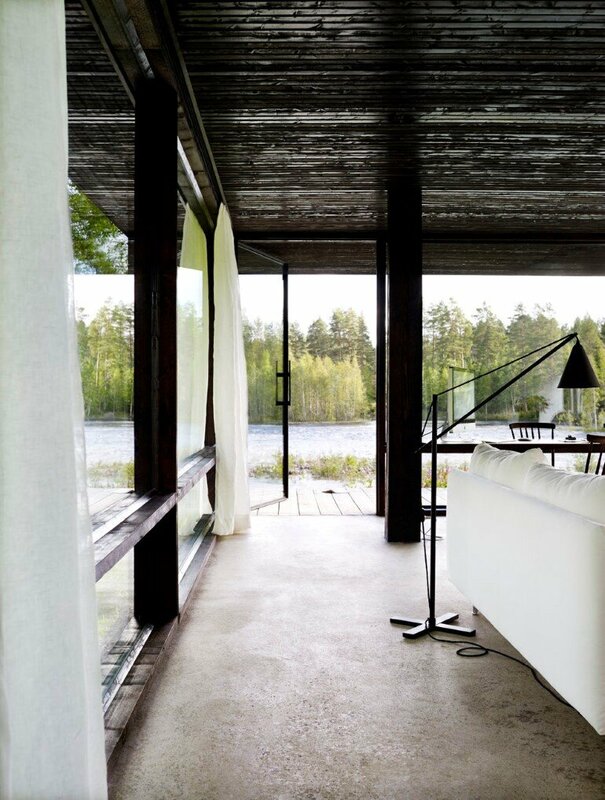 One of the prerequisites for building on the site — located right on the riverfront — was that the house be built within the existing foundation, which therefore became the premise for the project. 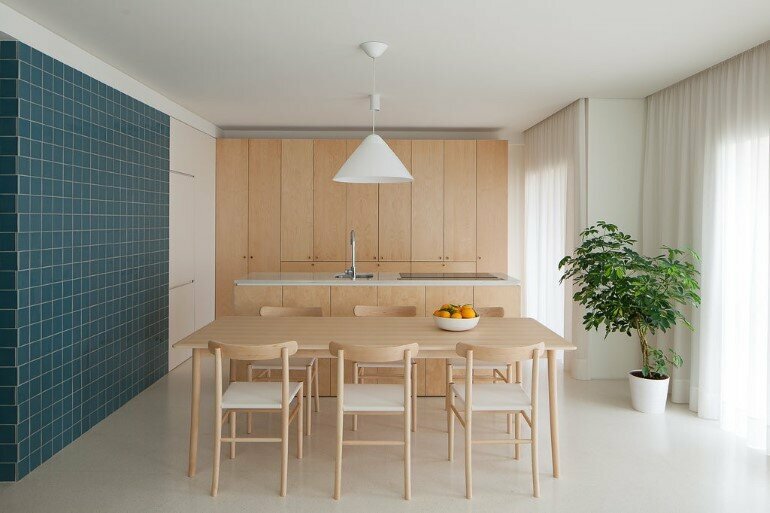 Over the course of seven years the architect designed and built the house as a case study. 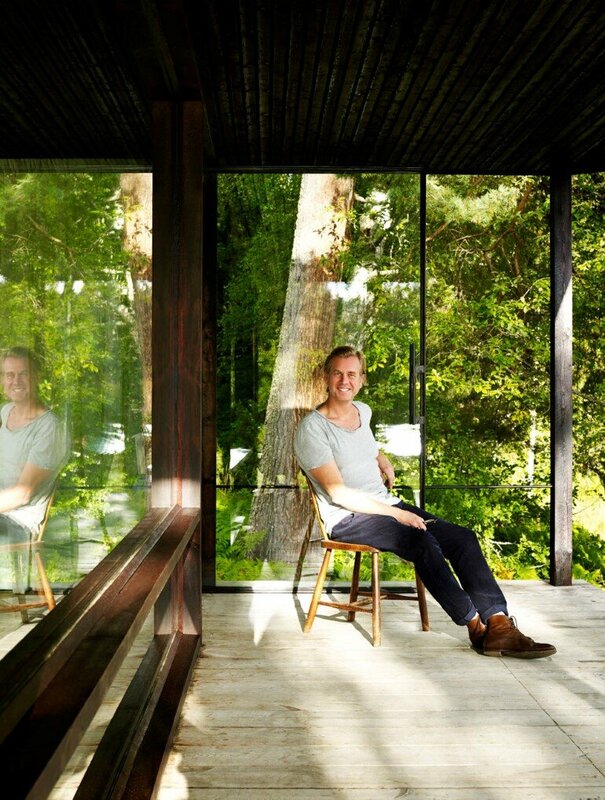 With design and construction evolving simultaneously, he has utilized several experimental ideas, including a floor that is heated by hot air from the fireplace, passive solar heating and a new form of wood roof covering. 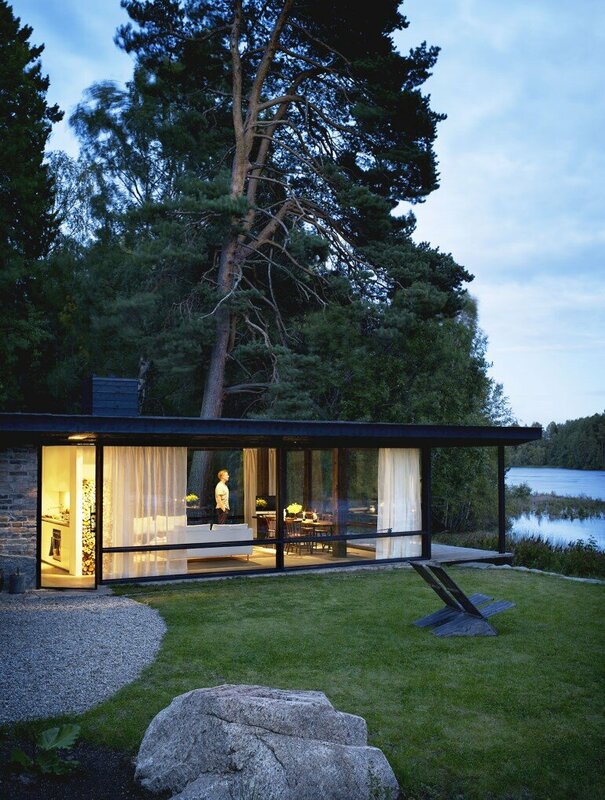 The secluded location, and scenery, made it desirable to have glass walls on three sides, which enclose the living room, kitchen and hallway; while the bedrooms and bathroom are located in the back of the house between walls built of bricks recovered from the site. 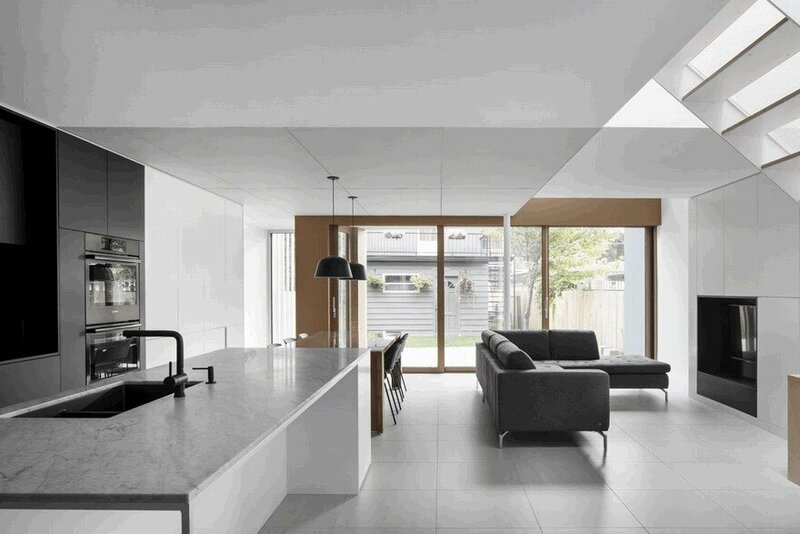 The house has been optimized to accommodate two adults and four children, gaining space partly by placing the kitchen in the hallway, which made room for a spacious living room with views of the surrounding nature. 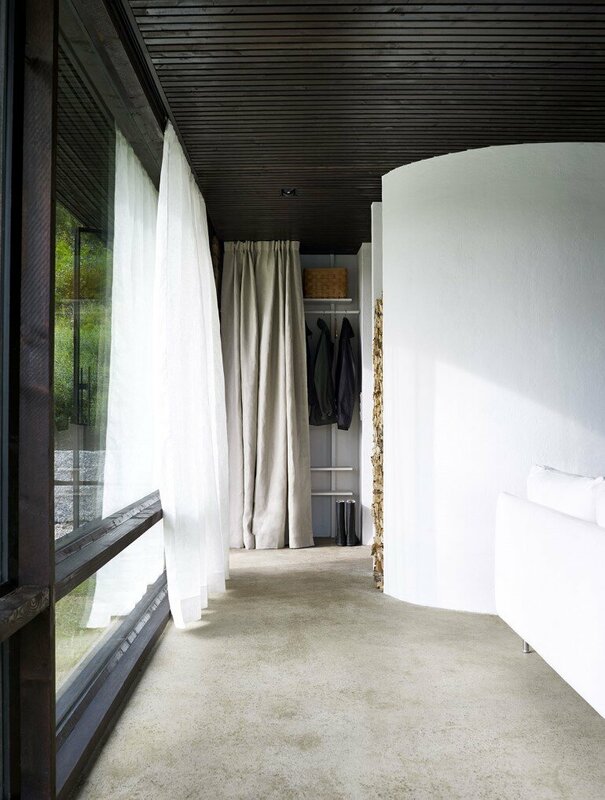 Locally produced linen curtains can be repositioned to frame various parts of the surroundings or to close the house for privacy or in periods of absence. 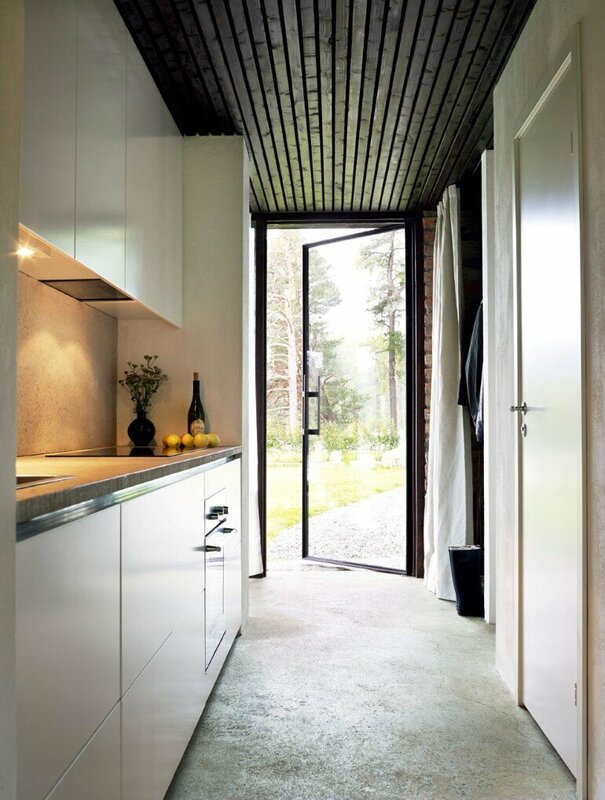 The roof is supported by two 9×9 inch wooden pillars of sawn spruce. 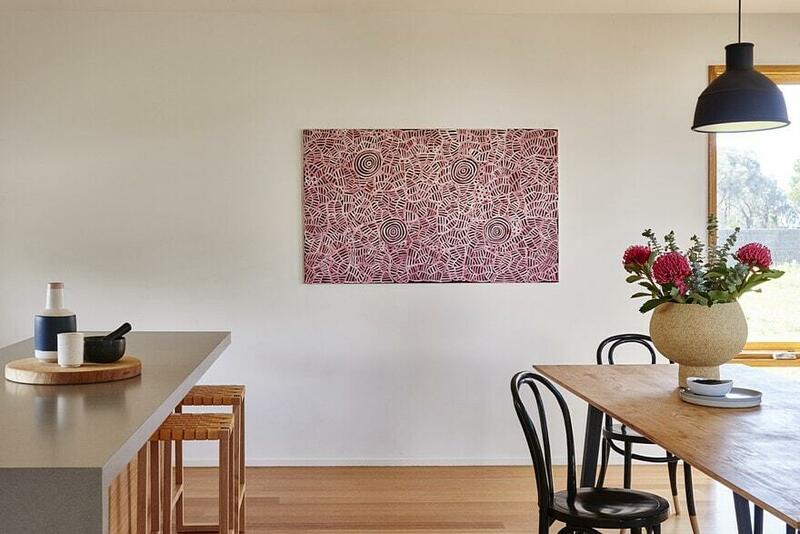 These, like all other wood in the house, including the ceiling, have been painted with tar/oil mix. 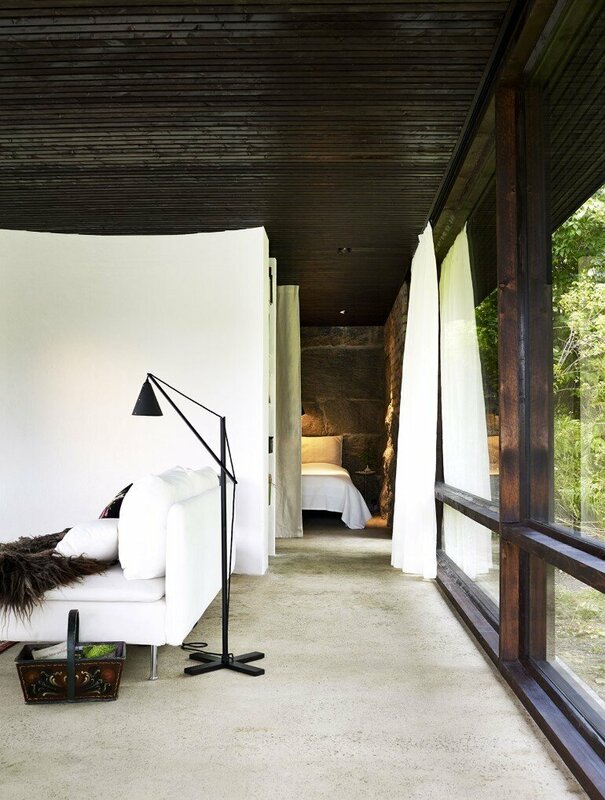 The dark ceiling, which continues out over the patio, gives the living room a clear horizontal direction and when light falls in the evening the ceiling dissolves into the night sky. 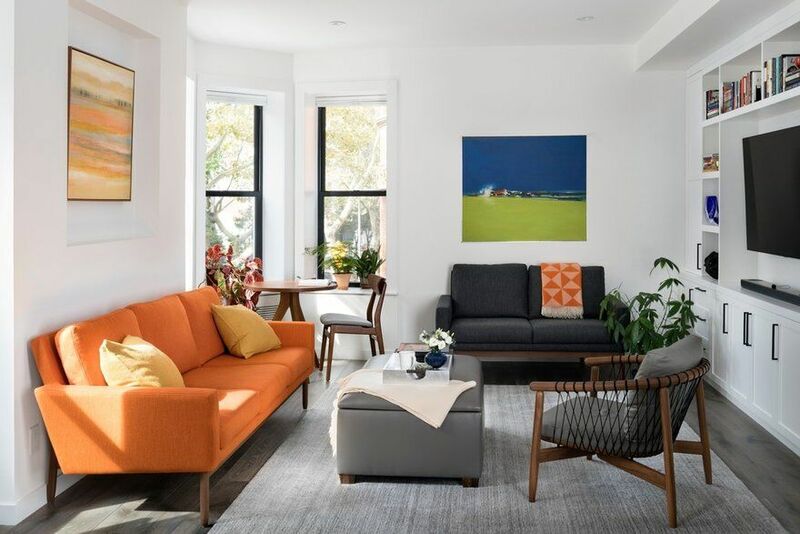 An important aspect of the house has been giving it a poetic dimension, that it should be a place where one can follow the changing light and seasons and connect with the surrounding nature in a straightforward manner. 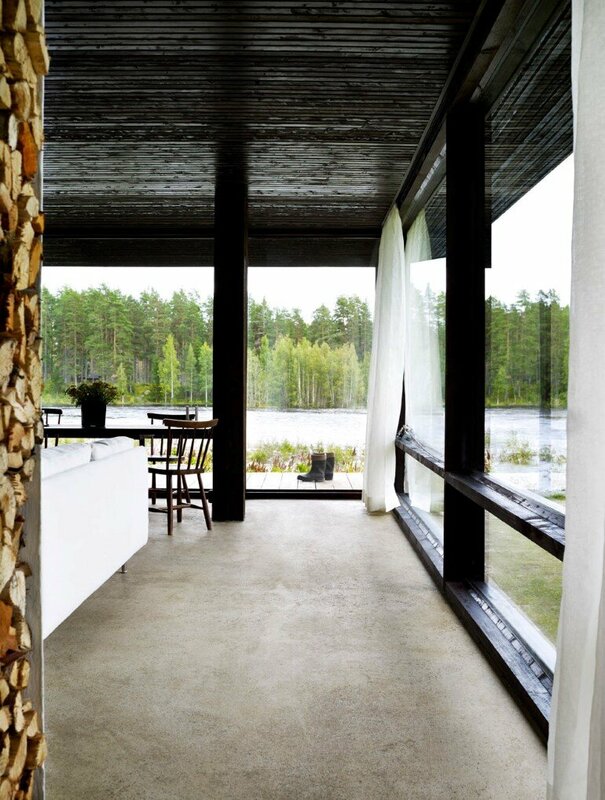 The house is heated with a central fireplace around which circulating air is heated and then pressed down under the concrete slab through a bed of clay pellets, providing an even and economic heat source. 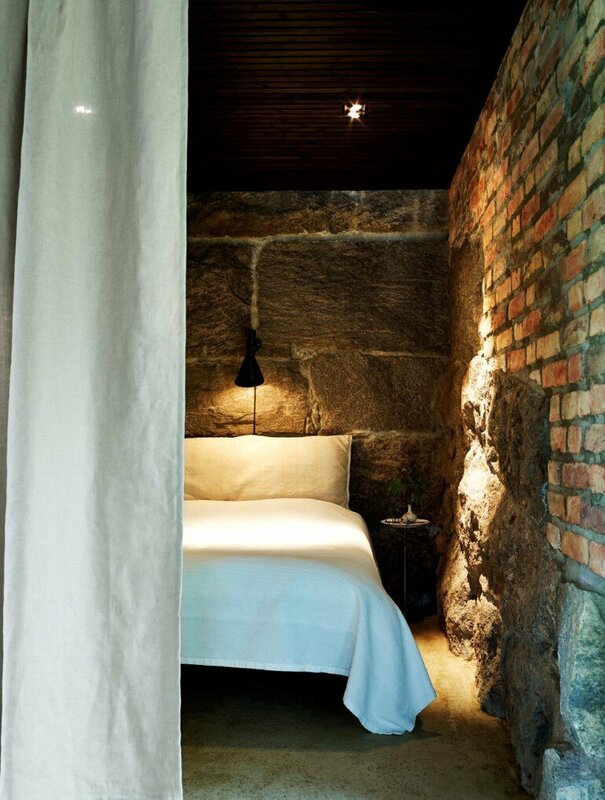 The incoming sunlight also heats the floor, which together with the heavy stone- and brick walls, store heat. This contributes to the house staying warm even during several weeks of absence. 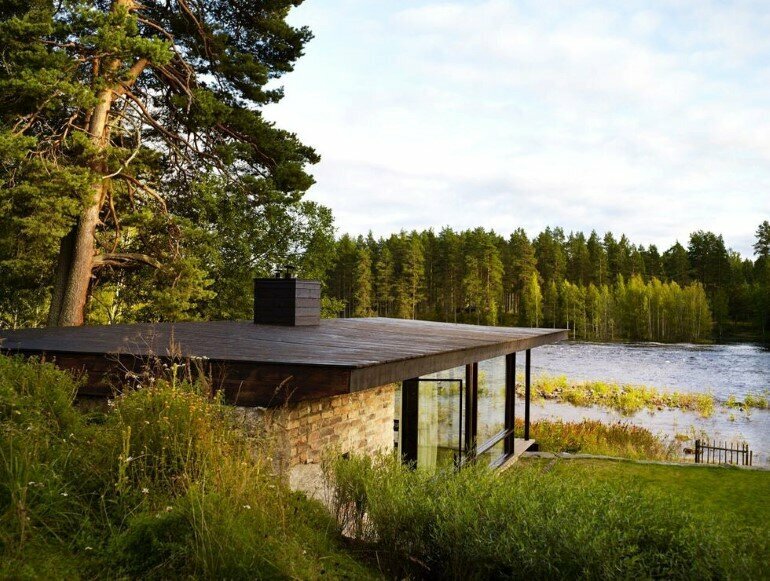 The water system is designed to be easily emptied, allowing the house to meet exterior temperatures, which in this part of Sweden may be below 30 degrees celsius. 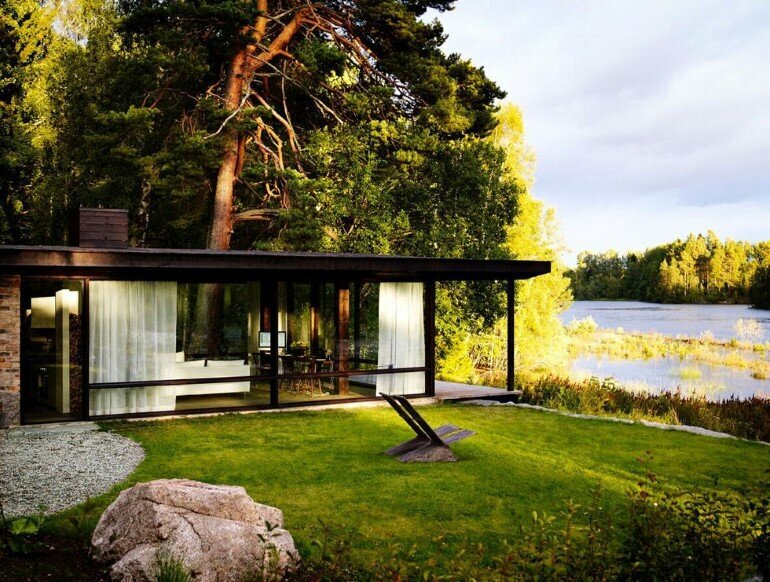 The Lundnäs House is an example of how thoughtful construction, using locally produced materials, and taking into account the nature and history of the region can combine contemporary aesthetics and philosophy with functional requirements, low construction costs, and a small ecological footprint.